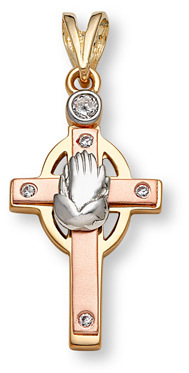 Beautiful tri-color gold cross with praying hands center-piece in 14k white gold. 4 small cubic zirconia stones accent the 4 sides of the cross with one larger cubic zirconia stone above the cross pointing upwards to the Resurrection. Approximately 5.0 grams of Guaranteed 14K Solid Gold. Measures approximately 1 1/16" tall by 3/4" wide, without hoop / bail. With hoop / bail, measures approx. 1 5/8" tall. Beautiful and unique cross design. We guarantee our 14K Gold Tri-Color Cross with Praying Hands to be high quality, authentic jewelry, as described above.